Annual Booksale Begins July 12th Mark your calendars, the library's annual July Booksale is only two weeks away! The sale will be taking place from Thur. July 12th through Saturday July 14th. Sale hours are as follows: Thur 7/12 evening early bird opener 5:00 - 8:00 PM. All Day Friday 7/13: 9:00 AM - 6:00 PM. Saturday 7/14 Special Sale: 9 AM - 1:00PM. Volunteers are also still needed to help out on sale days and with cleanup afterwards. If you can spare an hour or an afternoon, stop by the library or call us to add your name to the volunteer schedule. Library volunteers make the sale and lots of other great library services possible; we appreciate each and every one of you! Because we are running out of storage room, anyone wishing to make a donation to the library booksale is asked to contact the library first, before bringing books or other items to donate. Thank you for thinking of our library! “Dream Big, Read!” Summer Library Programs take place every Wednesday at 10 AM and again at 5:00 PM (except July 4th; program will take place at the regular time Thursday July 5th), through August 8th. All children, families and caregivers are invited! Themed programs feature age-appropriate reading and story telling, sing-a-longs, crafts, activities, snacks and a selection of books that can be checked out to take home. Upcoming themes include "Night Games" on June 27th and "Underground Secrets" on July 5th. Pre-Kindergarten through 2nd grade summer programs are Wednesday mornings from 10-10:30, 3rd-5th grade programs are Wednesday evenings from 5-5:30. Arts-n-Crafts Attacks: Youth from age 11 up and curious adults are invited to drop in for Arts-n-Crafts Attacks on Saturday morning from 11 am - Noon in the downstairs library clubroom. Create amazing art and crafts projects with paint,markers, pastels, found objects, yarn, fabrics, recycled materials, stamps, chalk, glue, paper, fingerpaint,and more. Special guests include some of Boscobel's best artists and crafters who's share tips and techniques to fire up your imagination. On June 30th we'll be joined by award winning portrait artist Carole Young and on July 7th, by Transparent Watercolor Society of America artist Jeanne Ruchti. All supplies and snacks provided free of charge. Traveling Troll Team Back by popular demand, our team of traveling trolls is ready to trek across the globe with you! Before you head out on that summer trip or vacation, stop by the library and pick up a travelling troll, complete with backpack, credentials and trip log to document your adventures together. Trolls who return with the best vacation pictures share a pot of prizes with their travelling companions! Stop by the library to see the Troll's vacation album from last summer. 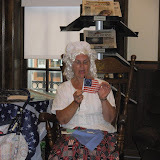 CSI Boscobel: Mystery's lurking at the library! What happened to George Hildebrand's mysterious brother Hugo who disappeared in 1922? What did the mayor know and how did George end up in France? Clues lead everywhere around Boscobel and maybe around the world!. Will you figure out whodunnit and win big prizes and everlasting fame as CSI Boscobel's top agent? The brave and curious can register and pick up a copy of Hugo's dossier anytime through through August 1st. Re-Imagine Your Library! What do you think our library will look like in the future? The “Re-imagine Your Library” Art Event invites you to show us-in pictures, photos, videos, words or songs. Winning entries will be eligible to become the official library graphic /logo for our centennial celebration in 2013. For more information about these or other library services and programs, please contact the library by calling 608-375-5723, email libraryboscobel@gmail.com or stop by to chat with one of our friendly librarians. Visit us online: Facebook : Boscobel Public Library , Twitter: #BoscoLibrary , Pinterest: BoscoLibrary Your library. Your community. Friends for life! We appreciate these free library programs, thanks a lot.